Around a month back we had reported how Reliance communications had listed its very first 4G LTE Wi-Pod device on its e-store and was accepting pre orders for the same with shipping promised from 25th May. We have managed to get the device early and decided to share a hands on experience and initial glimpses of the device and its user interface with our readers. So the pic above shows the Wi-Pod LTE in my hand just out of the box with its familiar pebble shape. The device which is manufactured by ZTE weighs only 80g and yet feels more premium than the Jio Mi-Fi (Which I have had the opportunity to explore long back). 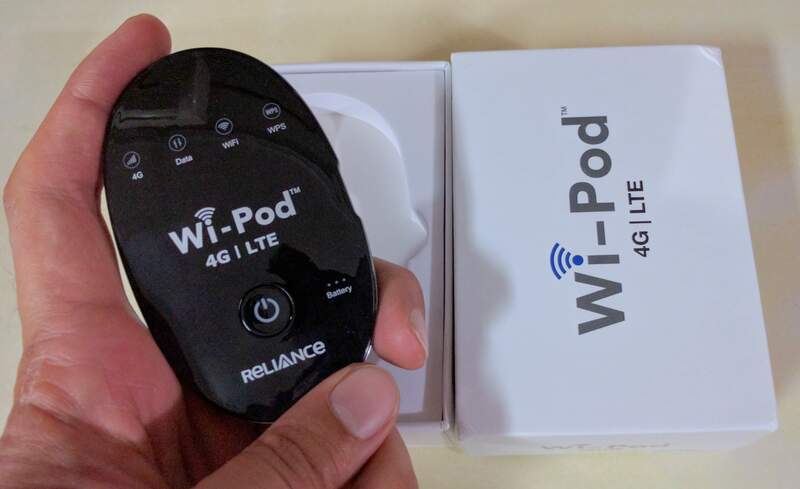 The front face has the power button along with the Reliance Wi-Pod branding and 5 Led indicators for LTE signal strength, uplink and downlink data transmission, wifi network, WPS and battery charge level. The left panel has the familiar micro USB charging and connectivity port. 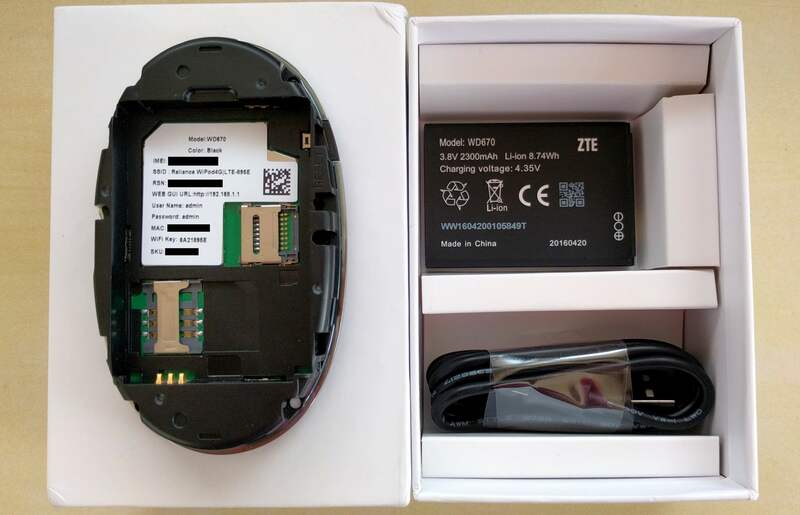 The pic above shows the device with its back cover removed and battery compartment exposed, there is a slot for a standard sized mini sim card and another slot for a micro SD card. the device comes with a 2300mAh battery and a standard micro USB cable. The Wi-Pod LTE supports download speeds upto 150 Mbps and upload speeds upto 50 Mbps and allows 31 users to simultaneously be connected to it over Wi-Fi. Also note that the device comes network locked to Rcom 4G with support for bands 3/5/40 and unlike the Airtel 4G hotspot this device does not support fall back on 3G or 2G networks. The device supports an easy plug and play functionality with Web GUI interface for faster and easy connection. The landing page is colourful with dedicated tiles for settings, connection, status, storage disk, etc. To the top right hand corner is a 4G signal indicator which currently shows no signal since the 4G network is not yet live, beside it is the connection status indicator and the battery level indicator. The status tab shows a record of the total quantum of data uplinked and downlinked in that particular session as well as through the life of the device. Note: The Wi-Pod LTE has been provided to subscribers of existing EvDO Rev.A and Rev.B dongles at varied discounts over the MRP of Rs.3199 ranging from Rs.899 to postpaid subscribers to Rs.1499 or Rs.2699 to prepaid subscribers based on average value of monthly data recharges.